Delicious Food & Spectacular Views! At The Historic Crags Lodge you'll get a real sense of history combined with the very essence of some of the most spectacular and picturesque panoramas nature has to offer. Ideally located in the heart of Estes Park on the north side of Prospect Mountain, this serene retreat getaway is only 12 miles from the famous Rocky Mountain National Park. The "Crags" has truly established itself as part of the history of this area, first opening its doors on the fourth of July 1914. This makes The Historic Crags Lodge the third oldest lodge in Estes Park. The founder of the Lodge, Joe Mills, and his brother Enos were largely responsible for establishing the Rocky Mountain National Park. 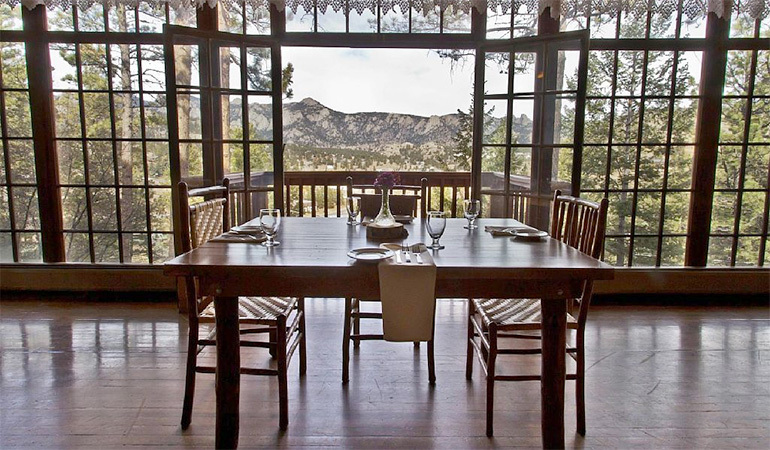 Our Restaurant and venue is ideally located in the heart of Estes Park on the North side of Prospect Mountain. Breathtaking mountain views and the view of Estes Park surround you, making this the perfect location for your special event.